President Donald Trump delivers a statement on the mass shooting at a South Florida High School from the White House, Feb. 15, 2018. U.S. President Donald Trump on Thursday vowed to "tackle the difficult issue of mental health," and to make school safety "our top priority." But he left gun control advocates frustrated by making no mention of the issue in reacting to the latest mass killing at an American school. One day after a 19-year-old man with a high-powered semi-automatic rifle killed at least 17 people at the Marjory Stoneman Douglas High School in Broward County, Florida, Trump acknowledged he was speaking "to a nation in grief." He also announced he would soon visit the community of Parkland, on the edge of the Florida Everglades, to meet with victims' families and local officials. Devoting a portion of his brief nationally televised address "directly to America's children," the president told them: "If you need help, turn to a teacher, a family member, a local police officer or a faith leader." He called on Americans to work together to change the culture to one "that embraces the dignity of life, that creates deep and meaningful human connections, and that turns classmates and colleagues into friends and neighbors." Students grieve outside Pines Trail Center where counselors are present, after Wednesday's mass shooting at Marjory Stoneman Douglas High School in Parkland, Florida, Feb. 15, 2018. After Trump finished speaking, one of the few reporters allowed in the Diplomatic Room to witness his remarks asked him, "Will you do something about guns?" The president — many of whose core supporters see unrestricted gun ownership as a constitutional right — left the room without responding. However, his silence did nothing to quiet the debate over American gun laws that erupts after every mass shooting. Nineteen of the nation's deadliest such attacks have occurred in the past decade. "This was an opportunity for the president to start a discussion about the need to recalibrate protocols governing how federal agencies and local authorities can utilize information pertaining to potential threats to public safety posed by maladjusted individuals," Michael Smith II, an international security fellow at the non-partisan New America think tank, told VOA. "The president squandered that opportunity." An official with the Coalition to Stop Gun Violence agreed. "It's really clear that the issue of gun violence gets Teleprompter Trump,'" said the group's media director, Andrew Patrick, declaring the president's six-and-a-half-minute address "devoid of emotion" and contending it "deflected blame to the mentally ill."
The president, Patrick said, "clearly doesn't particularly care about this issue." He noted that Trump received strong support in his 2016 election campaign from the National Rifle Association, a leading advocate for the rights of gun owners. The NRA has not responded to inquiries about the Parkland killings, and went silent on social media following the school shooting. However, the organization and its supporters have argued after previous mass shootings that the focus should be on the individuals who commit the crimes, not on the guns themselves. They also argue that the Second Amendment of the U.S. Constitution guarantees the right to bear arms. America's top law enforcement officer did not suggest any policy or legislative changes in response to the Florida shooting, but declared the status quo is not sustainable. Attorney General Jeff Sessions speaks about violent crime and opioids at the Major County Sheriffs of America 2018 Winter Conference in Washington, Feb. 15, 2018. "This situation that we have seen just cannot continue. We will take such action as we're able to take. 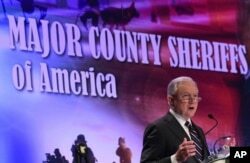 We've got to reverse these trends we're seeing in these shootings," said U.S. Attorney General Jeff Sessions at a conference of the Major County Sheriffs of America. He added "it cannot be denied that something dangerous and unhealthy is happening in our country." Sessions called for "effective enforcement" of existing gun laws. "It's not good if we've got gun laws that say criminals can't carry guns that never get enforced. So we intend to enforce our laws and, if anything, the recent events have caused us to know we need to do even more in the future," he said. America's resistance to passing stronger gun control laws baffles some observers in other countries. "Seems a bit much for mass shootings to be so regularly blamed on mental health problems in a country where it's easier to get assault rifles than antidepressants," said neuroscientist Dean Burnett, a lecturer at the Cardiff University Centre for Medical Education in Wales, in a Twitter posting. On Thursday morning, he wrote on Twitter that there were "So many signs that the Florida shooter was mentally disturbed." After a shooting in a Texas church in November killed 26 worshippers, Trump said it appeared that the gunman was a "very deranged individual." After a gunman in a Las Vegas Strip hotel fired on a crowd of concert-goers last October, killing 58 and wounding more than 850, the president tweeted the shooter was "a sick man, a demented man." Trump added, however, after that shooting that his White House would "be talking about gun laws as time goes by."